Lack of scalp oil secretion. Appears dry, dull and lifeless. Very dry, dull and damaged. Has split ends and breaks easily. After shampoo, appears oily and sticky. Excessive secretion of scalp oil. Human hair is 80% protein, 15% water and small amounts of lipids and inorganic materials. 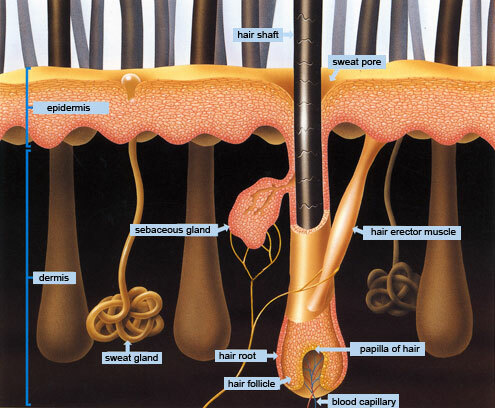 The growing hair follicle is richly supplied with blood vessels, and the blood that bathes the follicle is the transport medium for both essential and toxic elements. As these elements reach hair follicles, they are incorporated into the growing hair protein. As hair approaches the skin surface, it undergoes a hardening process, or keratinization, and the elements accumulated during its formation are sealed into the protein structure of the hair. Because of the exposure of hair follicles to the blood supply during growth, elemental concentrations of the hair reflect concentrations in other body tissues. Whereby we can divide types of hair into 3 : Oily Hair, Normal Hair & Dry Hair. The cuticle is the outermost layer of the hair which provides protection to the inner cortex layer. It is made up of flattened, hard, horny cells. When the cuticle breaks and dislodges at the end of the hair, the result is split ends. Improper care and frequent use of harsh chemicals on hair damage the cuticle. The cortex is the second layer. The qualitative properties of strength, elasticity, pliability, direction and growth pattern, width and the texture of hair depend on the composition of the cortex. The cortex is composed of fibers twisted together like a rope. It is the cortex which gives the hair its color. The presence of the four natural pigments black, brown, yellow and red are logged in the cortex in varying proportions, and the air spaces in the cortex determine the color and shade of hair. The excess black and deep brown pigment is what gives oriental women the dark hair they possess. Lastly, the medulla is the unimportant innermost layer which is composed of soft keratin. Medulla is often not present in some hair. Hair that lacks medulla is no worse than hair that has medulla.